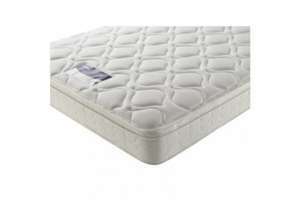 I have been using this mattress on a King size divan bed that I bought from Silentnight's website. I must say I find this mattress very comfortable. Medium Firm and high quality as you would expect from silentnight. I have been using it for nearly 6 months now and it is as new as day one despite the kids jump on it every now and then. I have just ordered 2 and saved £40 of the half price already. I think this multi buy saving is available on all mattresses. Deal posting newbie! This is jojo0007 first deal post. Help out by leaving a posting tip or just to show your appreciation for their contribution.